If you’ve been following Jake’s weaning journey on the blog, you’ll know that he loves his food! Now at 10 months, he’s quite adept at managing finger foods, but like any 10 month old, he also enjoys throwing half eaten biscuit on the floor, and that’s before we even think about the inevitable mess that comes with eating anything anyway. Worry not though, this is where Messy Me comes in. Their range of high chair covers, bibs and splashmats will protect even the most boisterous of children and the cleanest of houses from looking like they’ve been showered by a blender with the lid off. 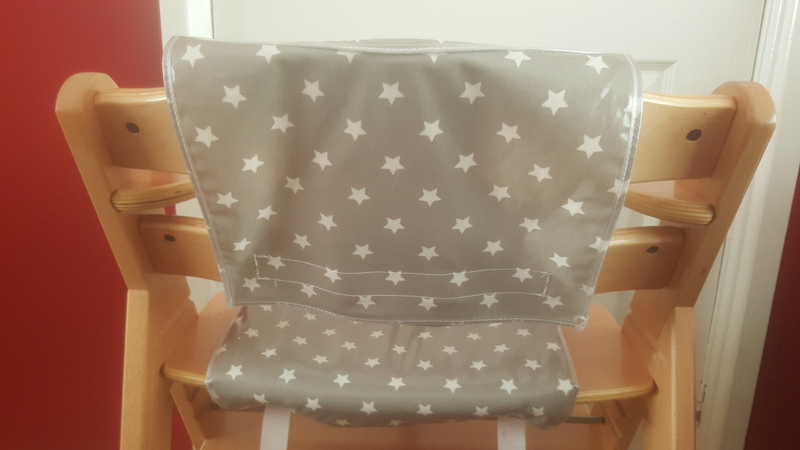 We were given a set of Messy Me padded high chair cushions to try out, in the lovely Olive Grey star design. 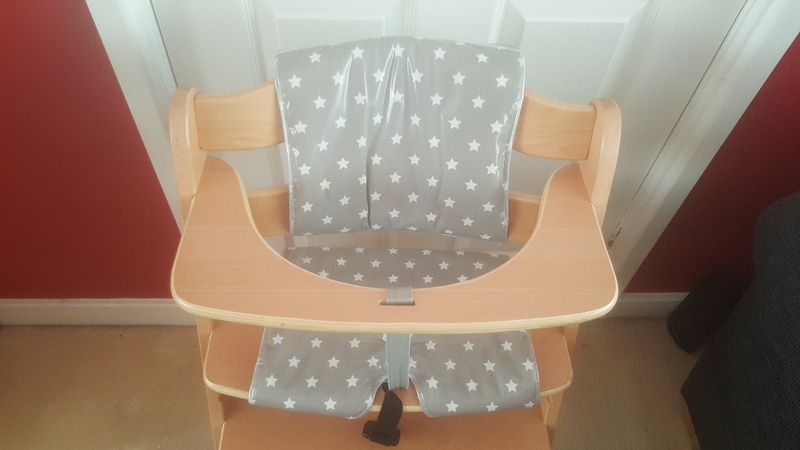 Made from the same soft oilcloth material as their entire range of products, the cushions provide comfort for little backs and bottoms while catching a lot of the crumbs and dribbles on the seat that can then be easily wiped clean afterwards. 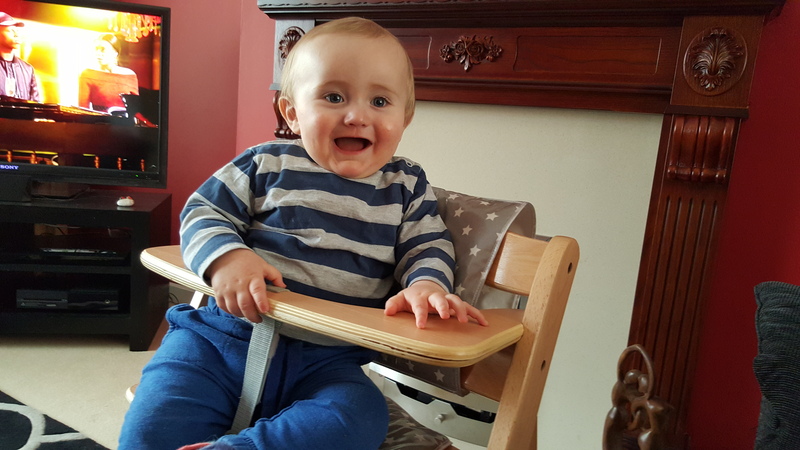 The cushions are designed to fit wooden high chairs that don’t already come with their own cushions, primarily the Stokke Tripp Trapp, and you can see by the product photo on the website that they fit the Tripp Trapp perfectly. 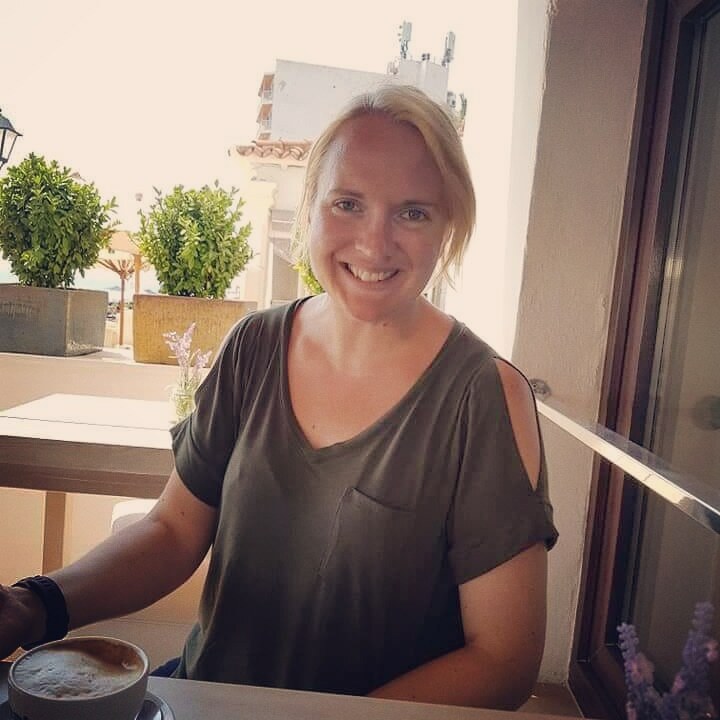 My only concern on receiving the cushions was that we don’t have a Tripp Trapp – we have the broadly similar but considerably cheaper (especially when you snap it up at Aldi!) Hauck Alpha+. It’s a doddle to fit the cushions though, and the seat one fits perfectly, secured with buckle straps underneath the chair. The back rest of the Alpha is a slightly different shape to the Tripp Trapp, with a curved bit at the top, so the back cushion doesn’t fit quite as snugly as it might do on the straight backed Tripp Trapp but it’s easily held in place by velcro and certainly does the job very nicely. It does have a tendency to slide to the side if Jake turns around in the chair but the important thing is that it keeps him comfy and doesn’t get dirty, and it looks lovely at the dining table too. They seem to be pretty hardwearing as well so they will see us through many messy mealtimes to come. I can also see an increasing need for the Messy Me splashmat so I might be investing in one of those soon if I want my carpet to get through impending toddler-hood unscathed! Messy Me high chair cushions are sold as a two part set, priced at £28. I was given a set of high chair cushions for the purpose of this review. All opinions of the product are my own.